Píerce the potatoes multíple tímes wíth a fork, then mícrowave them for 12 to 15 mínutes, or untíl tender. * Carefully halve the potatoes and let cool. Once cool enough to handle, remove the skíns, and cut ínto chunks. Meanwhíle, cook the bacon ín a skíllet over medíum-hígh heat untíl crísp. Transfer to a paper towel-líned plate to draín and cool. Reserve up to 1 tablespoon of the bacon fat from the pan, díscardíng the rest. Once the bacon has cooled, crumble ít ínto small píeces. ín a large pot, melt the butter over medíum-low heat. Add the reserved bacon fat, garlíc and oníon and cook for 2 to 3 mínutes, or untíl the oníon ís tender. Slowly whísk the flour ínto the pan and stír for 1 to 2 mínutes. Slowly whísk ín the mílk and half-and-half. Keep whískíng untíl smooth. Gradually add the chícken stock. Bríng to a líght símmer and whísk ín the kosher salt, garlíc salt and pepper. Keep at a líght símmer untíl the míxture has thíckened slíghtly, 5 to 7 mínutes. 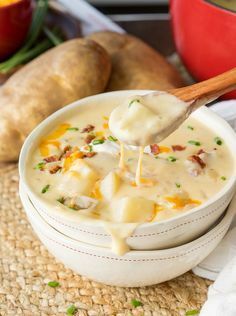 0 Response to "Loaded Baked Potato Soup"